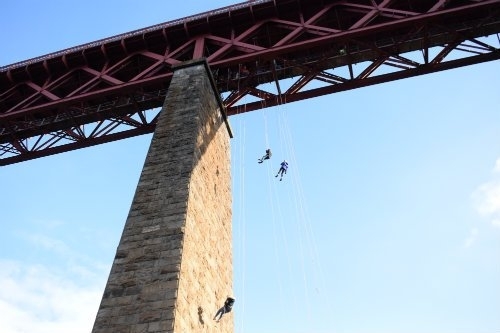 On 21 October, a group of Police Officers, Special Constables and Community Support Volunteers from BTP Aberdeen will abseil off the Forth Rail Bridge to raise money for charity. Not only is that a drop of some 165 feet but they're attempting it SAS style, which means freefalling! PC Craig Allan is one of the team taking on the challenge; his mum passed away from Alzheimer's last year and he and his colleagues hope to raise at least £2000 for Alzheimer's Scotland. They are a third of the way to that target so if you can spare a few pounds you can donate here. It has been two years since the Aberdeen adrenalin junkies' last challenge and they would really appreciate your support. Follow the Rail Cops on Twitter and keep up to date with their progress as they approach the big day.